Nicholas and Ralph Fitzherbert – a glimpse of the Wars of the Roses. Norbury in Derbyshire is mentioned in the Domesday Book. By 1125 it was in the hands of the Fitzherbert family who initially rented the estate from Tutbury Priory. The remains of the Fitzherbert’s medieval hall stands next door to the church. It was in this building, according to George Elliot’s imagination that milk maid Hetty Sorrel could be found. Historically speaking the building is a mishmash of reconstruction including a beam dated to 1483. One side of the beam is beautifully worked the other, not meant for public view, is still covered by bark. The Fitzherberts built a fine hall and an even finer church. The glass dated originally from the beginning of the fourteenth century – not much of it remains but the chancel is a beautiful ‘lantern’ flooded by light on three sides. Three alabaster tombs dominate the church. The stone came from just nine miles away and with the right camera traces of the original paints can still be glimpsed. Nicholas Fitzherbert, shown left, died in 1473. He was the eleventh lord. He’s wearing a collar decorated with suns and roses. The suns are representative of the sun in splendor reflecting Edward’s victory at Mortimer’s Cross in 1461 when a parhelion, which could have struck mortal dread into his army, was used by Edward as a sign of forthcoming victory – each one of the suns represented one the Earl of March’s surviving sons – Edward, George and Richard. The roses are, of course, the white roses of York. At the bottom of Nicholas’s collar, a pendant can be glimpsed beneath marble hands raised in prayer. It is a pendant of a lion. The white lion is representative of the House of March – and Edward’s Mortimer descent: a reminder that the House of York came from a line senior to that of the House of Lancaster. Anne Mortimer, Edward IV’s grandmother, was the great-granddaughter of Lionel of Antwerp. He was the second son of Edward III. So Nicholas, even in death, is declaring his allegiance to the House of York. He is also fully dressed in plate armour and his head rests on his helm but as Mercer states in The Medieval Gentry: Power, Leadership and Choice During the Wars of the Roses history does not know what Nichols’s role was during the Wars of the Roses or how he demonstrated his loyalty to Edward IV. One thing is sure, livery badges as these collars are often known were important indicators of political affiliation during the Wars of the Roses. It is known that King Richard III gave away huge numbers of his livery badges made from cloth at the time of his coronation in 1483. Richard’s personal badge – the white boar- a play on the Latin ebor meaning York and a reminder of Richard’s northern powerbase has been found on pendants and hat badges across the country including Richard’s home at Middleham Castle in Yorkshire. In Norbury, on the opposite side of the chancel from Nicholas there is a second alabaster tomb. It depicts Nicholas’s son Ralph, shown left and in the first picture in this post, and his wife. Like his father Nicholas is wearing a collar depicting suns and roses but the pendant is different. Nestled under Ralph’s hands is a tiny boar. 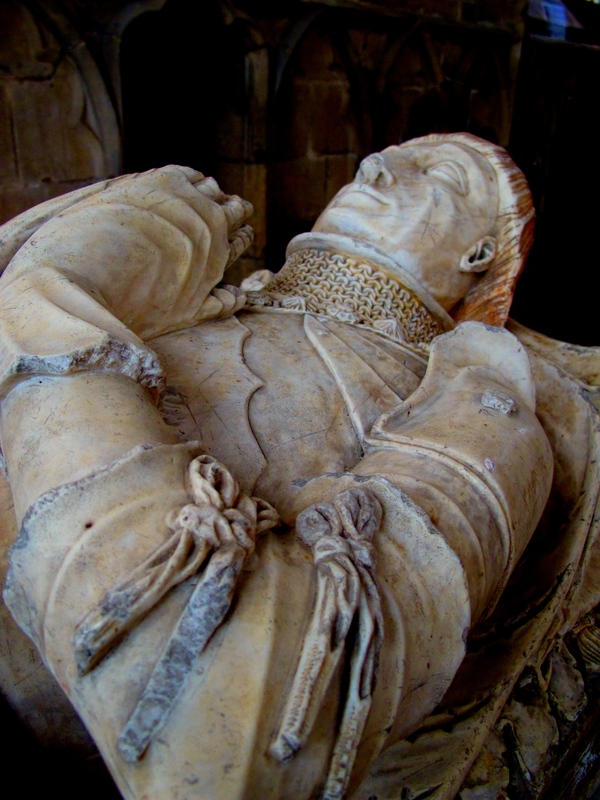 Ralph died in 1483 shortly after making his will requesting that he should be buried in Norbury Church so he could not know that a mere two years later the white boar would be evidence of untrustworthiness so far as the new Tudor kings of England were concerned. The Fitzherberts did not thrive under the Tudors; not because of their Yorkist fealties but because of their Catholicism. Like many of the old established families the Fitzherberts were conservative in their religious beliefs. By the reign of Elizabeth I the Fitzherberts faced severe financial penalities for their continued beliefs and Sir Thomas Fitzherbert would spend thirty years in prison because of his faith. This entry was posted in Church Architecture, Fifteenth Century, Kings of England, Wars of the Roses and tagged alabaster tomb, Anne Mortimer, Church of St Mary and St Barlok, Earl of March, Edward III, Edward IV, George Elliot, Hetty Sorrel, Lionel of Antwerp, livery badges, medieval alabaster tomb, Middleham Castle, Mortimer's Cross, Nicholas Fitzherbert, Norbury, parhelion, Ralph Fitzherbert, Sir Thomas Fitzherbert, Wars of the Roses in Derbyshire, white boar by JuliaH. Bookmark the permalink. History isn’t just for the past – it’s great source material for fantasy. The Wars of the Roses is especially rich with intrigue and twists. Reblogging on Archer’s Aim! Thank you for reblogging – and you’re so right about history being being great material for fantasy fiction. You are most welcome. I find when I read history it gets me thinking of great story ideas. Thanks for writing the post! England is a garden full of fact.The problem I see with history fiction must relate to ignorance of real happenings. After reading Jean Plady a reader argued about factual history as she had read about Anne Bullin Boylne Boylynne and had the facts from her books as fact. What Anne said to her father about her sister Marys affair with the King was in private.Yet because the writer of fiction went on to give a very good account of that meeting as if fact it was recorded as such by the none history reader. Fiction will always be fiction yet fact can never be changed. Fact being stranger that anything fiction can print I for one will stay the course with real recorded fact and never stray from the records hunted and found. As always a good point but I’m with Sir Walter Scott on this one – there’s so much we know and equally so much we don’t know – though I’m always amazed at what gets unearthed in the archives from time to time. It is undoubtedly important to be clear what is fact and what is fiction but because history is rather like a jigsaw with many pieces missing I’ve no objection to a well researched historical novel that fleshes out some of the missing bits- though I have been known to throw badly researched ones in the nearest charity shop bag. I really enjoy Alison Weir who interestingly moves between fact and fiction in her publications. I think too that with fantasy you move into a different dimension so it shouldn’t ever be mistaken for history – though I do like seeing if I can spot the historical inspiration in some writing.